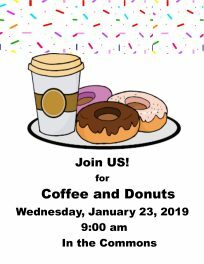 The College community is invited to enjoy coffee and donuts on Wednesday, January 23, 2019 at 9:00 am in the Commons Area, located in Building A. For more information, contact the Student Affairs Office at (575) 461-4413, ext. 189.